Recommended to be used in vehicles equipped with disc or drum brakes, including those with Anti-lock Braking System (ABS) and Acceleration Slip Regulation (ASR); hydraulic coupling systems. Formulated on the basis of special esters complex and low-molecular polymers, alloyed with an additive package. Contains revitalizant. Ensures reliable and safe operation of any braking system of a car. Guarantees perfect operation of braking system for 30 months (about 125 000 km). Stays incompressible under the most extreme operating mode (under continuous and intensive braking in hot weather), transfers the pushing from the brake pedal to the braking system immediately. Has a high wet boiling point (more than + 170 °C) which prevents the brakes failure as a result of liquid boiling. Ensures fast heat sink from parts of braking system, prevents brakes overheating. Due to low viscosity at low temperatures the product guarantees perfect performance level in cold conditions (below -50 °C). Prevents formation of deposits and keeps braking system in top condition. Fully compatible with all types of metals, alloys, sealants and pipelines, used in car braking systems. Due to revitalizant it protects friction surfaces from burr and corrosion and ensures smoothness of brakes operation without any blocking and sticking. 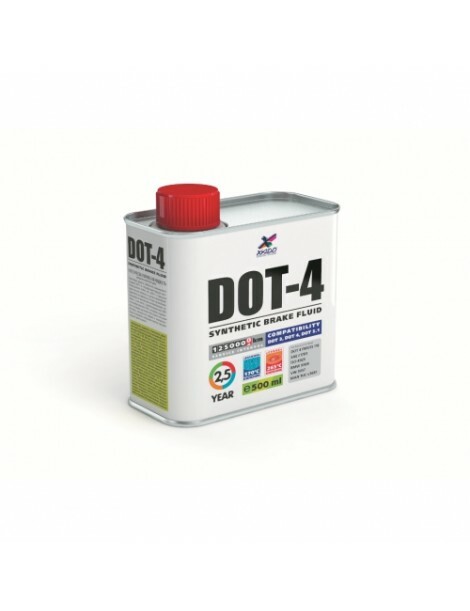 Revitalizant in XADO DOT-4 creates a new very smooth coating (Ra < 0,06) on surfaces of pistons and walls of brake master and working cylinders with a high level of anticorrosion properties. Prevents formation of tearing and corrosion, improves reliability and smoothness of braking system operation. Even in case of high moisture content in XADO DOT-4, the risk of brake sticking is decreased by 2 – 2.5 times in comparison with the fluid without revitalizant. Brake fluid is hygroscopic, that means it can absorb moisture. New brake fluid has very high boiling point (more than 260 °C) and stays incompressible even if the brakes heat up while intensive braking. The fluid transfers the pushing from the brake pedal to the shoes of braking system. In time moisture permeating through the pinholes of the pipes and seals cumulates in brake fluid which decreases its boiling point. Overheating of brake system can cause fluid boiling. Aero-steam gas bubbles appear during boiling. The fluid becomes compressible. Transfer of the pushing from the pedal does not occur immediately, the driver feels the brakes failure. Hygroscopic fluid can cause the risk of brakes seizure. Accumulative moisture can have corrosive impact on cylinder and piston materials. Corrosive products can lead to dysfunction of smoothness of braking system operation and can cause brakes seizure. The boundary wet boiling point is 160 °C. The fluid must be changed in 24 – 30 months of operation. Recommended to be used in vehicles where auto manufacturers advise to use brake fluids DOT-4 and DOT-3. Mixable with regular brake fluids (fluids of clear gold color DOT 3, DOT 4, DOT 5.1). It is not recommended to use this fluid in braking systems, working with fluid on mineral base (green color, LHM) or silicone brake fluid (purple color, DOT 5). Exceeds the requirements of American standard DOT 4 and specifications of the leading automanufacturers (BMW, VW,MAN) for the brake fluids for passenger cars and trucks.